heat kitchen appliance to 425 degrees. If pizza pie dough has been cold, take away from the electric refrigerator thus it will heat up a touch. Add walnuts to atiny low frying pan over medium heat; cook till gently cooked, stirring typically. Let cool. mix walnuts, garlic, basil, and spinach in a very food methodor; process till minced. Add Parmesan, olive oil, and salt and pepper to style. method till fully swish. Set aside. Cut broccoli into little florets and place in a very microwaveable dish with a lid. Drizzle with some tablespoons water, cover, and microwave till simply tender (about 3-4 minutes). Drain water from broccoli and put aside to cool down. Sprinkle 3/4 of the cheese cheese over the pesto. equally distribute broccoli and artichokes over cheese. high with remaining cheese and so sprinkle with feta. Bake pizza pie for twenty five to thirty five minutes, or till crust is brunet and cheese is gently golden. Let cool slightly, then cut and serve directly. Enjoy! 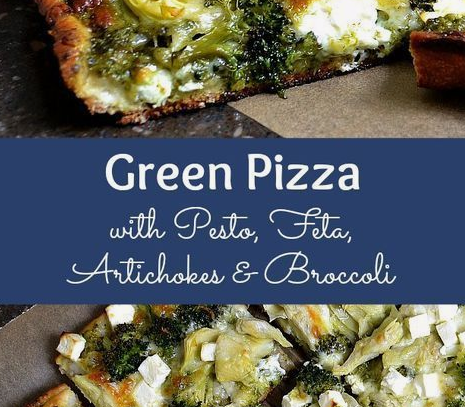 0 Response to "Green Pizza with Pesto, Feta, Artichokes, and Broccoli"